San Xavier Mission is 9 miles south of Tucson in the Santa Cruz Valley. The full name of the mission is San Xavier del bac Mission. But its called the San Xavier Mission. The mission is on the Tohono O’odham Indian Reservation. The San Xavier Mission is over 300 years old. Built when Southern Arizona was part of New Spain. Father Eusebio Francisco Kino, laid the first foundations of the mission. As a Jusuit Missionary Father Kino had a great influence on the inhabitants in the area. The current church dates back to late 1783. When Francisan missionary Fr. Jaun Bautista Velderrain began construction. The Tohono O’odham Indians were the principle labor force of that day. San Xavier Mission became part of Mexico following Mexican independence in 1821. The mission became part of the United States with the Gadsden Purchase of 1854. There is a museum at the mission that presents the history of San Xavier and many artifacts. The church retains its original purpose of ministering to the religious needs of its parishioners. San Xavier Mission exhibits the architecture and rich iconography of colonial Mexico missions. And a noted as an example of mission architecture in the United States. To this day, the San Xavier Mission stands as a symbol of the southwest desert. Construction used the available materials of the day. Low-fired clay brick, stone and lime mortar. Masonary vaults support the roof that covers the entire structure. This construction method makes it unique among Spanish Colonial buildings in the U.S.
History tells us little about the people who decorated the interior. Workshops in Queretero, Mexico created the sculptures. Then carried them by donkey to the Mission. Craftsmen created gessoed clothing once the sculpture was in place. The Baroque architecture style features playful dramatic elements. Theatrical curtain displays, faux doors, and marbling provide a sense of balance. An earthquake in 1887 knocked down the mortuary wall and damaged parts of the church. Extensive repairs began in 1905, under Bishop Henry Granjon. More restoration after 1939 when a lightning strike hit the West Tower lantern. A group of community leaders formed the Patronanto San Xavier in 1978. 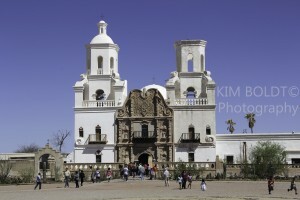 Their effort was to promote the conservation of Mission San Xavier. In 1999, a five-year program began. An international team of conservators took on the tasks. They cleaned and repaired the interior painted and sculptured art of Mission. The Patronato continues exterior preservation work begun in 1999. A team is removing the earlier coating of cement plaster, repairing the brick beneath. and re-finishing the exterior surface with a traditional lime plaster. But more work remains to guarantee this landmark for future generations. Because the builders ran out of money. The church did not get finished. You can even see bits of murals penciled – but never painted – on the interior walls. Why wasn’t it finished? It depends on the story you happen to hear. The legends are great stories, told and retold. Someone fell off the tower, and work stopped. If a building remained unfinished, its owners didn’t have to pay tax on it. A cyclone blew the dome off the east tower, and it was never replaced. Known as the “White Dove of the Desert, the mission is open daily. There is no admission fee. If you are in the Tucson area then a visit to the mission sure is worth your while. An extensive restoration is underway at the San Xavier Mission. But visitors are still able to tour the Mission and take in its stunning archecture. But check the schedule for specific hours and mass schedule – HERE! And if you are ready for a short “roadie” there is another mission not far from Tucson. The Mission San Jose de Tumacacori. It was established by Father Kino 1691. Although not as grand as San Xavier Mission, it is the oldest mission site in Arizona. Tumacacori, AZ is about 1 hours south of Tucson on I-19 near Tubac. When you go there, Wisdom’s Cafe is a must stop! Other popular Tucson attractions include Kitt Peak, Pima Air & Space Museum, Old Tucson Studios and Arizona Sonora Desert Museum. For a more complete list of Tucson attractions – HEAD HERE! Looking for Houses For Sale Tucson Az OR looking for Tucson Arizona Real Estate? We can help!